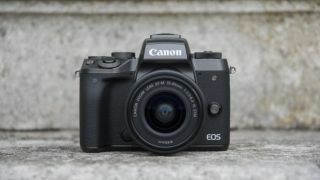 Some of today's most tempting deals are on Canon's APS-C mirrorless cameras - the EOS M range. There are some serious savings here on what were already pretty decent prices..
Amazon UK has cut a phenomenal £235 off its usual price for this APS-C 24 megapixel mirrorless camera, with its 18-140MM f/3.5-6.3 IS STM kit zoom. That brings the price down to £664 for this great flagship minature mirrorless camera, and a great choice for those who want something for travel photography - thanks to its impressive superzoom lens which comes with this kit. Amazon UK has cut offer £30 off its usual price for this APS-C 24 megapixel mirrorless camera, with its 15-45mm f/3.5-6.3 IS STM kit zoom. That brings the price down to £449 for this great lightweight starter kit for anyone wanting to get into interchangeable lens photography - and that is a cool £200 saving off the RRP for this camera. This is the black version of the camera.